The Computex Taipei 2014 Summit Forum, organized by the Bureau of Foreign Trade and run by the Taiwan External Trade Development Council (TAITRA), was held in tandem with the 2014 edition of the internationally-watched ICT (Information and Communications Technology) event, the annual Computex Taipei expo. The Summit Forum was attended by industry luminaries such as Stan Shih, Acer Chairman; Tsai Ming-kai, Mediatek Chairman; Simon Segars, CEO of ARM Holdings and Shane Owenby, Amazon Web Services’ APAC Managing Director. The four leaders were invited to share their insights on the Internet of Things (IoT) and cloud services along with the theme of “Integrating Hardware and Software for Smart Internet of Things”, giving event attendees from all over the world a window to see the cutting-edge development in the ICT world from a global perspective. In his speech, Huang Wen-jung, TAITRA Secretary-General noted that the many disruptive advances brought about by mobile computing and cloud technologies over the last few years have pushed the global ICT into a brand new phase, with even international research firm McKinsey and the US President Barack Obama stating that as the foundation of the so-called “Internet of Things”, mobile computing and cloud technologies are set to change humankind’s lifestyles in a radical fashion. At the event, Stan Shih spoke about how Acer had leveraged its hardware and software service experience to accelerate its “Build Your Own Cloud” (BYOC) service, in order to establish Acer as a mature player that supplies “Hardware + Software + Services”. He also stated Acer’s intentions to partner its suppliers and distributors to create a new value-added industry chain. 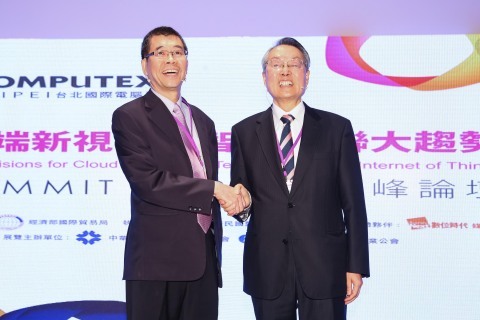 Shih also invited Tsai Ming-kai of Mediatek on-stage for a photograph, expressing his confidence that future tie-ups between the two companies will create a better IoT experience for consumers. Tsai underscored the crucial role Taiwan has played in the development of the global ICT scene over the last three decades with its strong competitive edge in areas such as hardware manufacturing, product development and services. As the world moves from Cloud 1.0 to Cloud 2.0, Taiwan players must work together to maintain the virtuous cycle of Moore’s Law and technological advances in the semiconductor industry. Simon Segars spoke at length about the importance of innovation. Beginning with the century-old maker of the iconic Jelly Bean, he spoke about how innovation was the key to winning consumers in areas as diverse as the automobile and electronic industries. Taking remote monitoring on the dog at home as an example, Segar also discussed various IoT applications and how they can be commercialized. According to Shane Owenby, the key to the spectacular success of Amazon Web Services (AWS) achieved in mere five years is “scale”. Thanks to scale, AWS was able to provide a tremendous amount of capacity to consumers at affordable prices. In addition, Owenby also spoke about how AWS is able to provide individuals, corporations, governments, schools, etc., with highly customized cloud services solutions. At the Summit Forum, Simon Chang, Minister of Science and Technology, explored opportunities for Taiwan together with the four speakers. In the opinion of Shih, with regard to the emergence of the IoT, large corporations should establish platforms for young Taiwanese to develop and show off their skills; on the other hand, Tsai emphasized the need for players along Taiwan’s product chains to think deeply about how they can enhance their competitiveness through various kinds of consolidation. Segars suggested that Taiwan should direct the semiconductor talents to the IoT field. In fact, this was one of the reasons RAM chose to set up its CPU design center in Taiwan, while Owenby encouraged Taiwan to further nurture its innovation capacity in order to remain competitive on the world stage. The four spoke for nearly five hours at the event. Not only did they sketch an informative picture of how human life may look like in five to ten years’ time, they also provided tantalizing glimpses at how the global ICT industry may harness cloud technologies in their business strategies. Surely, the Computex Taipei 2014 Summit Forum was one of the most forward-looking tech events this year.